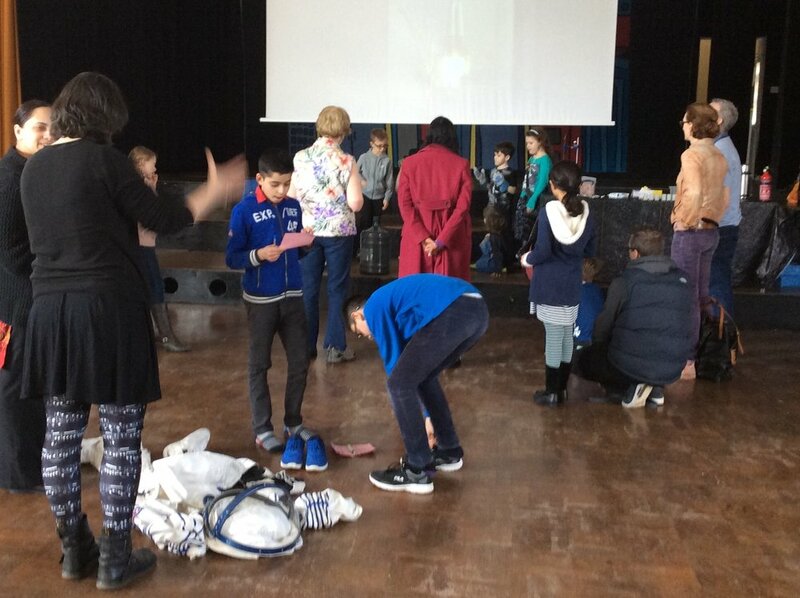 On Sunday 2nd April 2017 Wycombe Astronomical Society held its second Cosmic Kidz event.....an astromomy and science show for families. 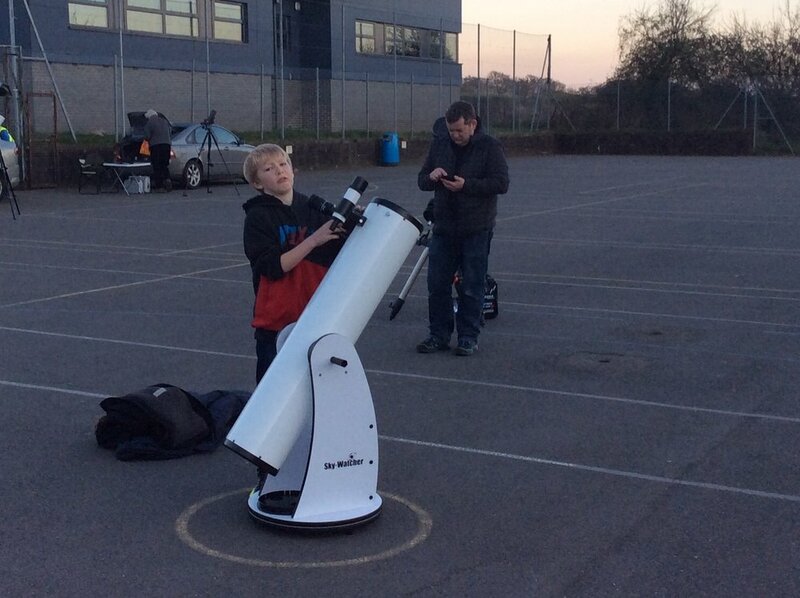 This year we were able to tie this in with the BBC's Stargazing Live programmes, being broadcast from Australia. The event started at 2.15pm at a new venue - Amersham School in Amersham. Guests streamed in steadily from the start and this continued throughout the afternoon. It is difficult to estimate numbers but there must have been 130 or so and all were treated to a fun afternoon. Firstly, the sun was shining! This meant that the children and adults could enjoy some solar viewing. 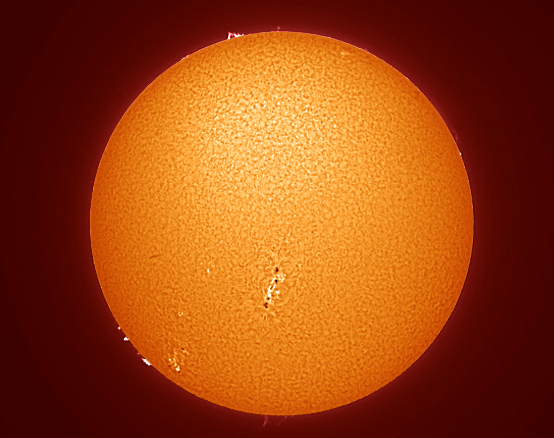 Several members had set up their telescopes and solar scopes which allowed for safe viewing of solar prominences and sun spots. Inside there was a variety of displays and exhibits. We had 5 planetarium shows throughout the afternoon and each one was full. This was run for us by Mark at The Black Hole planetarium and all children and adults came out saying that they had learnt something. There was space food for the children to try - freezedried ice cream and freezedried strawberries. The mint chocolate ice cream was particularly nice! Paul Hill from the European Space Agency put on an excellent show - with explosions and "count downs" and the opportunity to wear a genuine spacesuit. WAS member, 13 year old Rio, gave two excellent talks which were well received and we had an indoor telescope display too. The children had the opportunity to enter a competition by answering questions related to the show....what is the area in space called in which you have to wear a space suit in order to survive? (The Armstrong Line), Identify the object down the microscope (head louse), How is space food preserved? (freeze dried) etc. The winning entry won a digital microscope. There was also the prize raffle in which a "GoTo" scope was the first prize and a pair of binoculars the second. The lovely clear weather continued into the evening which allowed the second part of our event - the Stargazing Live part - to take place. This was just as busy as the daytime event and children and adults were treated to many a fine object. For a lucky few that arrived early the planet Mercury was a real highlight. Jupiter, another big highlight rose later in the evening and this produced the usual wows. M37 a lovely cluster in Auriga, M42 - Orion Nebula, the Moon and other objects were on display throughout the evening. Huge thanks must go to all members who helped during the day and evening...no matter how big or small a role each member had it was a real team effort that made the event so successful one. Over 60 guests at Waddesdon Manor enjoyed a rewarding stargazing evening in the company of members of Wycombe Astronomical Society. Following a leisurely dinner (while waiting for the clouds to disappear!) the guests listened to a short talk in the Powerhouse by Sandy Giles entitled “Celestial Signposts” – all about using constellations and stars to locate astronomical objects in the night sky. 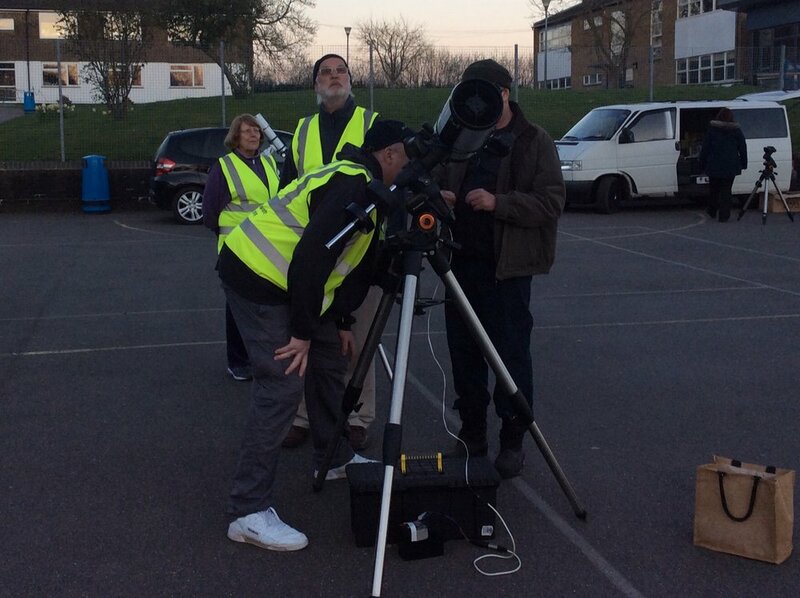 Then, thankfully, the skies cleared and the guests joined about fifteen WAS members on the parterre to see a wide range of objects through telescopes – Jupiter, M42, M3, M45 to name a few. Mark Cullen’s cumulative image stacking setup was particularly popular, showing spectacular views of the Leo Triplet, M81/M82, M51 and M101. All the guests were very appreciative of this now regular outreach event and as an indication of just how lucky we were with the weather, the roads all the way home were wet indicating that rain had fallen - everywhere else but Waddesdon! Members of Wycombe Astronomical Society have had two lovely evenings of watching the Perseids recently and both with clear skies. The first event, on Thursday 11th August, was held at Waddesdon Manor. Waddesdon arranged an evening meal and lecture followed by Perseid observing for their paying guests. Sandy delivered another excellent lecture titled “The Restless Universe” which was well received and afterwards they joined members of WAS on the Parterre. Although not perfectly clear it was good enough to enable the guests to see some bright Perseids as well as other objects through the telescopes. About 20 members of WAS assisted and had a very enjoyable evening. Then on Friday 12th August we had our annual Perseid BBQ. The day had been beautifully sunny and this continued well into the evening. This year the society borrowed two BBQ’s from members Mark C and Sarah W and these were lighted at 7pm with the view that they would be ready to cook on by 8pm when members would start to arrive. Unfortunately Sarah was a little over zealous with the charcoal and it took a while for them to really get going, helped with some frantic fanning by Sandy. Once ready to cook on though they were far better than the disposable BBQ’s that we have used in the past and some excellent BBQ food was cooked (and cremated). As in previous years the society also provided the drinks for the evening and these went down well with only a couple of bottles remaining at the end of the evening. About 40 members and guests enjoyed the evening and we all saw at least one Perseid! We also saw a nice pass of the ISS low in the southeast. Several members took cameras in the hope of catching a Perseid on “film”. 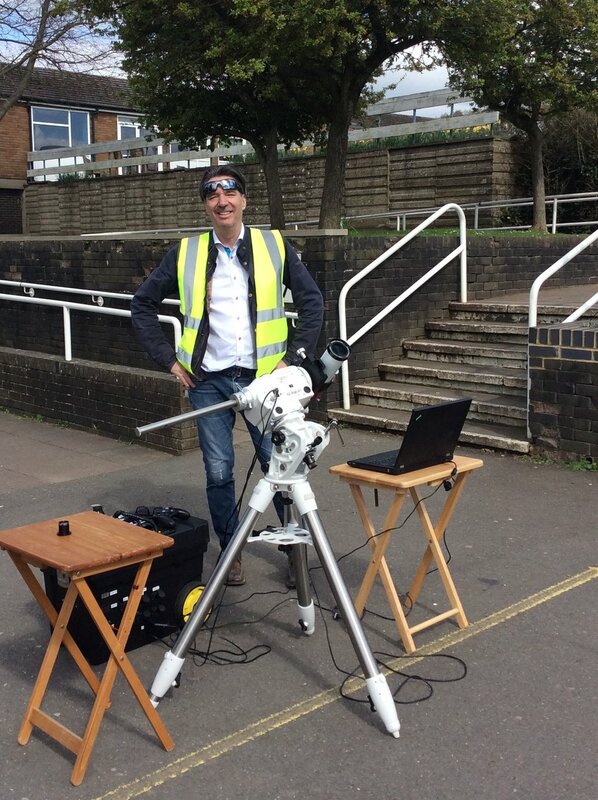 A couple of telescopes were set up and two Ioptron sky trackers had their first airing too. All in all, two excellent evenings’, viewing the Perseid meteor shower. Some of the members enjoying the evening.